If we work off the assumption that roleplaying games are stories which follow straight lines until they encounter a node, then we need to ask how these nodes arise. Without nodes we might as well be reading a story or watching a movie. It's a valid pastime, and many people engage in it. But then again a lot of people complain about the choices made by novelists and script writers. Roleplayers engage in a different pastime (they may read books and watch movies as well, but this blog isn't about those hobbies). Roleplayers engage in their hobby to make choices of their own and explore the consequences of these actions. Some choose to explore certain settings through the personae they create. Possibly settings from movies or books, maybe even using the characters portrayed in those books (or thinly veiled facsimiles of those characters...but that's an entirely different blog entry). Scene 1: In which our characters awaken in a large room. Lying on cold metal tables, they have vague recollections of who they might have been but they have no idea of why they are here. Scene 2: In which our characters are escorted to their private quarters, where they are given free reign for the night. Scene 3: In which the premise of the game is described, and our characters have their circumstances explained. Scene 4: In which our characters start their first investigation and have their first chance to properly explore the setting. Scene 5: In which our characters reach a climax within their investigation, and start to define how they will work as a team. Scene 6: In which our characters face their first deep moral decision. Game concludes with the players really thinking about where they'd like to go. These days, that's about as strict as my planning process gets. As I said in a previous post, we're playing D&D. Old School D&D. I've been itching to run a decent campaign for a while. The last few starts I've made have all lasted a couple of sessions at best. More oftren than not, some kind of real-world issue causes a fight between players...who then take it out on one another's characters...then the resentment comes back out of game. It's frustrating and one of the reasons my regular gaming group fractured over a year ago, then gradually crumbled away. We still socialise together, but gaming just has a way of bringing up old wounds within that group. For the last 18 months, the only games I've GM'd or played have been at conventions. I've spent more time analysing and designing, less time playing or GMing. It's probably led to a bit of detachment from the physical/social act of gaming. Then came a double hit to solve my problems. First a trio of Norwegians, then a distress call on Nearbygamers. "The rules of the finite game may not change; the rules of an infinite game must change. "There are at least two kinds of games: finite and infinite. An infinite game has no fixed rules or boundaries. In an infinite game you play with the boundaries and the purpose is to continue the game." The essence of the Vector Gaming Theory comes down to a simple concept. There are story vectors where narrative flows from one place to another in a straight line. 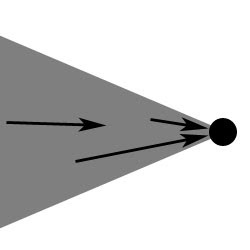 There are game nodes where the direction of the narrative is diverted through the actions of players or mechanisms within the game. At any stage in a roleplaying session; one of these two modes of activity has been engaged. These two may never be engaged simultaneously, but the degree of rapidity changing between the two modes may give the impression that they are occurring at once. Let's look at this from a macro scale. Last year it was all about mechanisms, how they interacted with one another, what they've been used for in the past, why they sink or swim, and where I'd like to take them in the future. It was a series of components. This year is a series of processes; observing the way mechanisms link up into interactive storytelling media. Just like last year, I'll be casting my net far and wide. I've already had thoughts about live roleplaying, computer gaming, miniature wargames and tabletop roleplaying. My aim here is to generate a clear and precise terminology for the description of games. I'll draw on the concepts of many who have gone before me, but I'll try to avoid many of the loaded terms that hamper discussions about roleplaying game design. In this regard I'll also generate a few of my own terms, linking more closely to the gaming vector theory being developed.